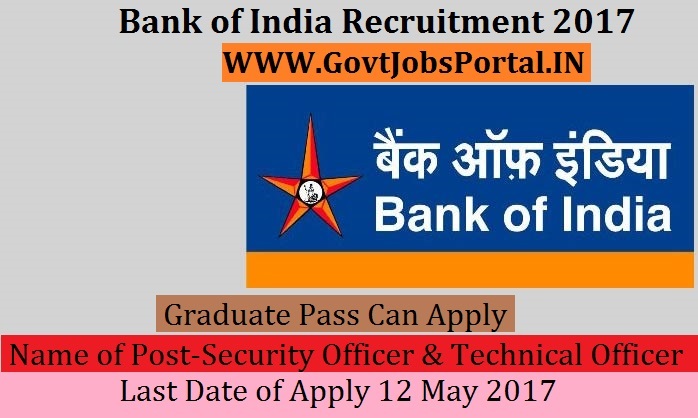 Bank of India is going to recruit fresher candidates in India for Security Officer & Technical Officer Posts. So, those candidates who are willing to work with this organization they May apply for this post. Last Date of Apply 12-May-2017. Total numbers of vacancies are 32 Posts. Only those candidates are eligible who have passed Engineering degree in discipline such as Textiles, Chemical, Mechanical, Electrical, Electronics, Production, Metallurgy, B. Pharm, Petroleum Technology, Plastic Technology, Oil Technology, Power Engineering from recognized University / Institute with 60% marks. Indian citizen having age in between 21 to 40 years can apply for this Bank of India Recruitment 2017. Educational Criteria: Only those candidates are eligible who have passed Engineering degree in discipline such as Textiles, Chemical, Mechanical, Electrical, Electronics, Production, Metallurgy, B. Pharm, Petroleum Technology, Plastic Technology, Oil Technology, Power Engineering from recognized University / Institute with 60% marks. What is the Process for Selection this BOI job? 1: Selection will be held on Online Examination. 2: Selection will be held on Group Discussion. What is the Application Fee for these BOI Jobs in India?